In the New Process window, Input track selections will not change automatically, so you will need to change these as required. APT needs two Input signals to operate, whereas Doubler and Warp just need one. 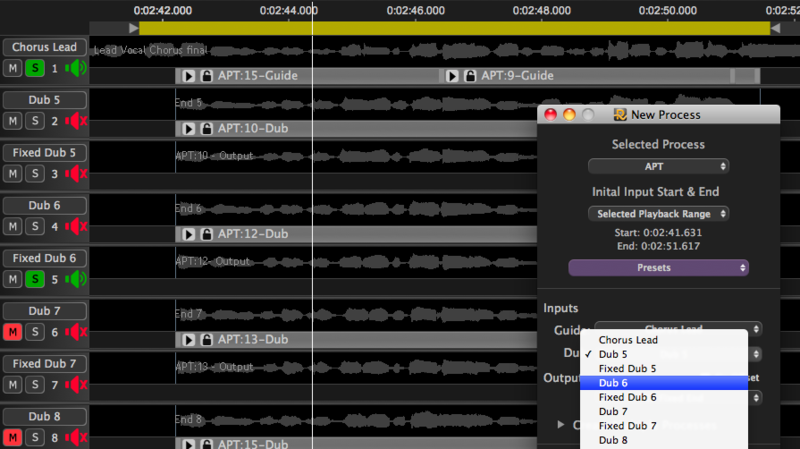 The New Process window shows both Guide and Dub input selectors for APT (below left), but only one Input selector for the Doubler (below middle). To select an Input track, LEFT CLICK the drop-down menus under the labelled Inputs to display all the track names in the Revoice Pro session (above right). Then LEFT CLICK to select the Track name that contains the audio you want to provide the relevant input of the process. In the APT example pictured below, "Dub 5" had been the selected Dub track for the previous process and the blue highlight shows that the new choice for the next APT Process' Dub Input will be "Dub 6". The Output track, unlike the Input tracks, will automatically change to any new track that is created in the Session, because often this is the reason for creating the new track. Because of this automatic switching, you should always check the New Process Output selector shows the correct Track name before creating a process. 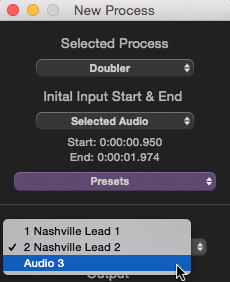 If you need to add one or more tracks to receive the process outputs, you can use the Add or Insert Track command. Output signals and processes from the Doubler will be automatically labelled with a unique sequential number for easy identification (for example Dblr:Lead vox, Dblr:Lead vox(2), ... Dblr:Lead vox(n)). Also in this case it is possible to create multiple output tracks using "Create multiple processes" option, as discussed further in the Doubler section. If the Output track needs to be changed before creating a process, LEFT CLICK the drop down menu under the label Output in the New Process window. All the session tracks will be displayed. 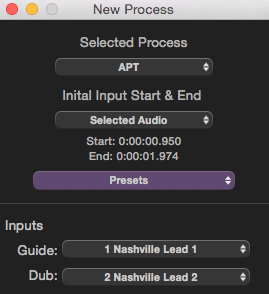 LEFT CLICK the required Track name to select the new APT process Output Track, as shown in the example pictured below where Audio 4 is being selected as the Output Track. TIP: Sometimes, the quickest way to correct a wrong input or output track selection is to simply UNDO the create New Process step, select the correct track(s) and redo the New Process. Alternatively, you can also move the Process Control Block. In the New Process window, LEFT CLICK the Guide or Dub Process Control Block so it is selected (green) and when the hand icon appears, drag the Process Control Block to the desired track (or new position). The start, end or position of any Input Process Control Block can also be adjusted. Once all the desired modifications are complete, render the modified output. To change an Output Track selection, first make sure the Output audio has been rendered. 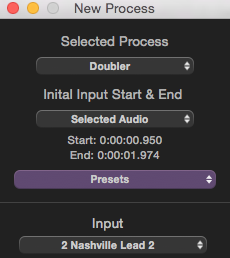 Then drag the Output audio to the desired new Output track. 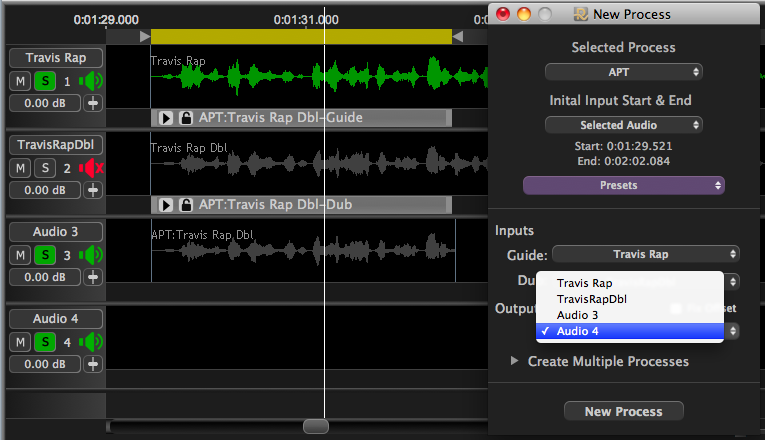 To do this drag, RIGHT CLICK on the output audio and select "Edit Audio" from the pop-up menu. Then LEFT CLICK on the output waveform to select it (if it isn't already selected) so it is green, and then drag it to the desired new Output track.